It’s been about two months since I read an article that jump-started our initiative to eat less processed food. It’s been going well so far. I hope to share my thoughts on the past two months soon, but today I wanted to share a couple ways I’ve found so far to save money on a real food diet. First is a flax egg. I’ve mentioned this several times before so it might not be new to you. A flax “egg” is 1 tbsp of ground flax mixed with 3 tbsp of water. Let it sit for a few minutes to gel and then you can substitute it for an egg in almost any recipe. I find it works best in pancakes, waffles, and quick breads & muffins. We buy a big bag of organic golden ground flax at Costco. We can get several dozen flax “eggs” out of it and I believe it costs around $7. Organic eggs however are quite expensive, often costing more than $4 a dozen at the store. At the market last weekend a vendor had organic chicken eggs for $6.50 a dozen! My thought is, if I am going to spend that much on eggs, I want to actually enjoy the taste of the eggs, not bury them in pancake batter. So I use flax eggs almost exclusively in baking and we try to reserve our real eggs for eating only. Although I haven’t done the exact math, the cost per flax egg is much cheaper than the cost per real egg. The second money saver is relatively new to me: homemade oat milk. Oh She Glows posted a recipe awhile back and I’ve made several batches of it in the last two months. All you need is a cup of steel cut oats, 3-4 cups of water and a blender. 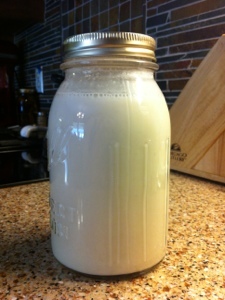 The active time is 15-20 minutes (there is some pre-soaking involved) and the result is almost a quart of “milk”. I mainly make the plain, unflavored version and use it in recipes that call for milk. Again mainly pancakes, waffles, muffins, etc and then we also use it in smoothies. We buy the Whole Foods brand of organic, unsweetened almond milk to drink which costs about $5.60 per gallon. Using homemade oat milk whenever I can in recipes leaves the almond milk for drinking, mainly for our son. This lets the almond milk last longer, saving us money in the long run. To break down the cost savings, a pound of steel cut oats costs $1.49 from the bulk bin at Whole Foods. A cup weighs approximately 6 oz which makes the cost of a cup $0.56. One cup of oats will make about a quart of milk. The almond milk we buy costs approximately $1.40 per quart so you can see that it is much cheaper to use the oat milk. I try to use the unflavored oat milk in any recipe where we can’t taste the difference. I did make the flavored version once and tried drinking it straight. It was ok…..definitely an acquired taste I think. Oat milk can get a tad on the slimy side which can make it a bit unpalatable when drinking it straight from the jar. We did enjoy the flavored version in green smoothies. I think it would also work in plain pancakes, perhaps giving the flavor a bit of a twist. I wanted to try it on cereal but never got around to it as we don’t eat a lot of cold cereal. A word of caution though – homemade oat milk is only good for about 5-6 days. So I will only make up a batch when I know we’ll be able to use it within that time frame, either via baking or in smoothies. No sense spending the time making it if it’s just going to go to waste. It also settles in the fridge quite a bit, requiring a really good shake before you use it. I hope these two tips are helpful. If you have any to share please do so in the comments below. Have a great weekend! Do you think it would work to make the oat milk and freeze it in ice cube trays, then pop out and put in zipper bags to use for recipes?